CEO Oscar Munoz asked the press to meet Polaris, the airline's new business class branding, in New York on Thursday. As part of United Airlines’ mission to win back consumers’ trust, the airline unveiled United Polaris, a makeover of its business class cabins, on Thursday. 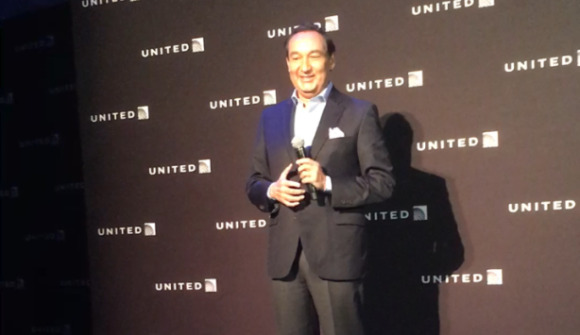 United Airlines president and CEO Oscar Munoz introduced Polaris at a press conference in New York on Thursday morning, noting that it will include an in-flight food and beverage experience, custom bedding from Saks Fifth Avenue, amenity kits, and a lounge. The first United Polaris lounge will open at Chicago O'Hare International Airport in December. Munoz said during the press conference that he is focused on winning back customers’ trust, so the airline is making "serious investments in our people, technology, our mobile lab, the products we offer around our system, our club experience, coffee, and free snacks." Maria Walter, United Airlines' MD of product and brand strategy, told PRWeek that customers’ trust has been "shaken" since the airline merged with Continental Airlines in 2010. "We have had two different airlines with two different products that we have had to bring together and maybe [customers] didn’t always know what to expect when they were traveling on us," she said. "So we are making sure we are consistently communicating what to expect and delivering on that every single time."